Mongolia has had a long and expansive history, at one point in its history, controlling an empire from Korea to Hong Kong, to Baghdad, and Eastern Europe. However,that empire soon began to unravel, and Mongolia shrank back to its homelands between northern China, and southern Russia. Soon, Mongolia fell under the control of the Qing Dynasty of China, and remained there until the rise of the Bogda Khaanate in Mongolia, and in 1912, they where able to declare independence from China. 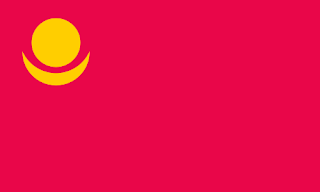 The flag they adopted took the Soyombo symbol, in gold, and placed on a red banner edged in gold. 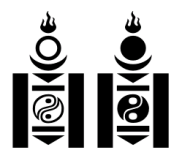 The Soyombo symbol is deeply important in Mongolian history. Unfortunately, the Kyakhta Treaty of 1915 was hugely damaging for Mongolia. Mongolia wanted independence, China wanted all of Mongolia to be subsumed as provinces within China, and Russia was willing to hand the Inner Mongolia territories to China, and the Outer Mongolia territories to be autonomous, but within China. Unfortunately for Mongolia, the pressure was so great, they had to agree to Russia's proposal. The Russian Revolution of 1917 saw China send troops into Mongolia to "protect" Mongolia from the Red Army. However, the Chinese soon forced the Mongolian government from power, and set up a puppet regime, and set about subjugating the population using any and all means necessary. Including force. The Mongolian Peoples Party was formed after 2 Revolutionary groups merged, and they sought to get help from Soviet Russia to drive out the Chinese. Bogda Khaan did not want to agree to any arrangement with this new group, but in the interest of driving the Chinese out, he stamped the letter to Moscow. Moscow sent the Red Army into Mongolia to assist with driving out the Chinese, and to chase elements of the Russian White (Czarist) forces that had fled to Mongolia, and sided with the Chinese. The battle was fierce, but swift, with the Chinese soon expelled. 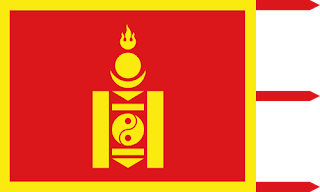 Bogda Khaan was kept as the head of state, but the real power now lay in the hands of the Mongolian Peoples Party who set about turning Mongolia into a Communist, one-party state, complete with a new flag. The first flag was the red banner of Communism, with a golden sun disc and crescent emblem in the upper hoist on the flag. The logo was part of the Soyombo symbol of Mongolian lore. 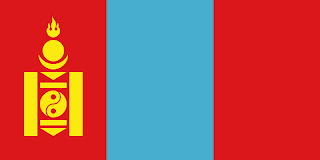 In 1924, with power consolidated in the hands of the Mongolian Peoples Party, they brought in a new flag. 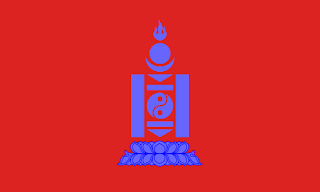 Again, a red banner, but placing the whole Soyombo symbol in the centre of the flag, in blue. They also placed the star of Communism at the top of the symbol. 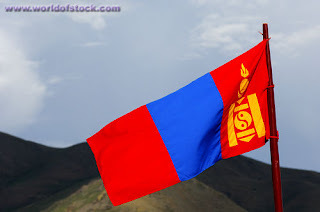 In 1940, Mongolia adopted yet another flag. 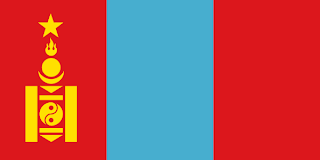 This time, a tricolour banner, of red, blue, and red. The Soyombo symbol is now gold, and placed in the red stripe on the hoist side of the flag. Again, with the star of Communism set atop. With Gorbachev's Glasnost, and the loosening of state control in Russia, so Mongolia followed. The Mongolian Peoples Party amended the constitution in 1992, allowed the formation of opposition parties, and relaxed many of the previously tight controls. The "People's Republic of" in the name of the country where dropped. The first free elections saw the Mongolian Peoples Party win, and it was not until 1996 that they began to lose seats. Another part of the change was the introduction of a new flag. However, the change of the flag simply meant to take the flag from the People's Republic of Mongolia, and remove the star of Communism. Leaving the Soyombo symbol as the primary element. The Soyombo symbol is hugely important in Mongolia, appearing all over the country, including on a hillside outside the capital of Ulanbaatar. The Soyombo symbol is a geometric design that represents the basic elements. At the top, is fire. A symbol of growth and success. The three tongues of flame represent the past, present, and future. The sun and moon symbols underneath represent the Father Sky, taken from the shamanistic religion of Tengriism. The two triangles represent spears. They point down to announce the defeat of Mongolia's internal and external enemies. The two horizontal rectangle shapes give stability, and represent honesty, and justice. The Arga-Bilig (Yin-yang) represents the mutual compliment of man, and woman. The two vertical rectangles offer protection, representing unity and strength. It relates to a Mongolian proverb. "The friendship of two is stronger than stone walls."